Whenever possible links are included to the websites or articles mentioned in the newsletter (they are highlighted in blue or purple and underlined, so you can't miss them). If one of the links doesn't work this normally indicates that you're using adblocking software - try disabling it temporarily (or else use a different browser, such as Chrome). Findmypast have added well over a million records to their collection of Devon parish registers - there are now baptisms from over 500 parishes, banns from over 400 parishes, marriages from over 500 parishes, and burials from well over 500 parishes. You'll full details of the coverage, parish by parish, here. Most of the records include images of the parish registers - and as a result of these new additions I now have a colour digital copy of my great-great-great-great grandparents' marriage in 1805 (previously all I had was a black and white photocopy from my visit to the Exeter Record Office 10 years ago). I've also discovered the baptisms of 5 of their children that I didn't know about before, so a busy weekend is in prospect! It's now obvious that at some point between 1815-17 my 4G grandparents moved to a different parish on the other side of the Salcombe estuary, but that's something that's really tough to pick up when you're at the record office and have only got a limited time to search (there are 10 other parishes that are just as close as the one they moved to). As most of you will already know, it's possible to achieve so much more when the records are online and indexed - in less than 2 minutes I found records that I could have spent 2 days or 2 weeks searching for (and possibly still not found). Also added to Findmypast this week was the Devon Wills Index, which lists around 300,000 wills from 1163-1999 (I believe it is the same index that was previously available exclusively at Origins). 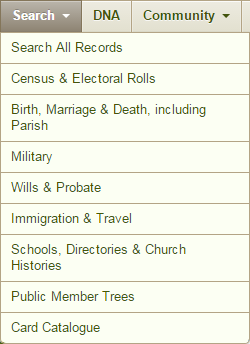 Sadly many Devon wills were lost when the Probate Registry was destroyed World War 2, but in some cases the index will direct you to surviving copies or abstracts. According to an article posted on the BBC on Sunday, 19 year-old WW1 soldier Ben Cobey, one of the first casualties of the Great War, was left off the War Memorial in his home town because he was illegitimate. A free search of the military records at Findmypast revealed 4 records in respect of young Ben - follow this link. In the February article Was your ancestor a war hero? I mentioned the records of the Middlesex military Service Appeal Tribunal which have been made available online at the National Archives. There's more information on this topic in an article posted on the BBC website last weekend, which points out that, contrary to common perception, very few of the men who applied for exemption from military service did so because they were conscientious objectors. Findmypast have recently started talking about Local subscriptions - they're the subscriptions which are unique to each of their sites around the world (whereas a World subscription covers every country). After the initial 30 day period, your subscription will be automatically renewed at the normal price of £9.95/$9.95/9.95€ unless you un-tick the 'auto-renew my subscription' box in the My Account section of the site. Note: if you already have a Local subscription at another Findmypast site you won't be able to take advantage of this offer as Findmypast users cannot have two subscriptions concurrently. Sites like Findmypast and Ancestry face a difficult challenge - how can they make their site appealing to beginners without reducing the utility for more experienced users (as most LostCousins members are)? At either site beginners tend to go for the first option in the Search menu (or use the very basic Search form on the home page), whilst more experienced users who are trying to fill a particular gap in their knowledge generally choose one of the collections. When you search one of the collections you can filter the search results in order to focus in on a particular record set - so on the face of it, there's no reason to go straight to the record set using the Card Catalogue (at Ancestry) or the A-Z of record sets (at Findmypast). 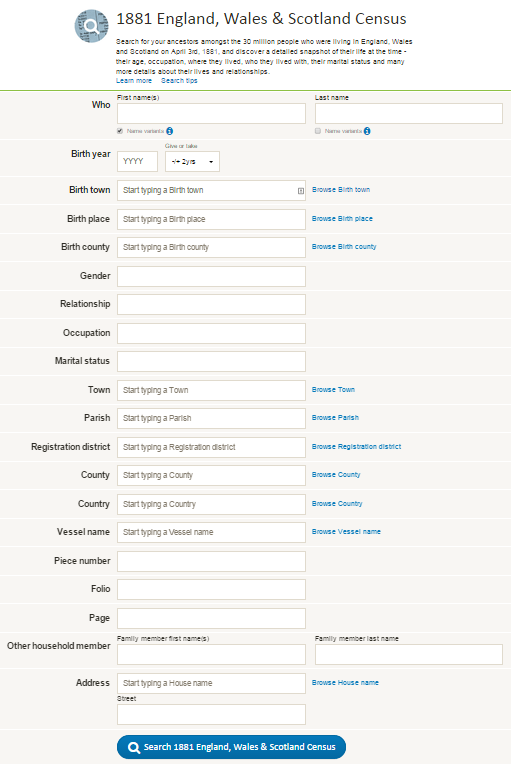 As you can see, there are LOTS more boxes on the form, which means that you've got a much wider range of search options. Of course, as any experienced user of thise sites will tell you, filling in more boxes on the Search form is usually a big mistake - it's something you only do when you get more search results than you can handle. Beginners usually assume that the more information they enter, the more likely they are to find the records they're looking for - but in reality it works the other way round. The smart approach is to only fill in the information that is most likely to lead you to the right records. So, for example, if you've got an ancestor with an unusual first name that might be the only piece of information you enter. Always try to avoid entering birthplaces when searching the census - because even if your ancestor knew where he was born (and many didn't) there can be many different ways of writing it down. For example, I've seen birthplaces for people born in London which are as imprecise as 'London', or 'Middlesex' - or as precise as the name of the street. At Ancestry the difference between the Search forms is not quite as pronounced, but that's only because Ancestry offers less options (for example, you generally can't search by address or occupation). I'm hoping that Findmypast will offer a similar feature at some point in the future - as the wealth of records on these key websites grows we'll need all the help we can get! when I was researching the next article, to find out when I'd last written about Essex Ancestors, and what I'd said. It's a great way to find an article in an online newsletter or blog. Tip: you may get different results depending whether or not you precede the website address with 'www'. The Essex Record Office has approximately 70,000 wills in its collection from the 15th century to 1858, and 22,500 of those wills have recently been added to the 20,000 already line (you can read more in their blog). You can now check the validity of the references for relatives you've entered from the Ireland 1911 Census - simply click the button alongside the head of household, and if you've entered the correct NAI reference the census page will be displayed in a new tab. 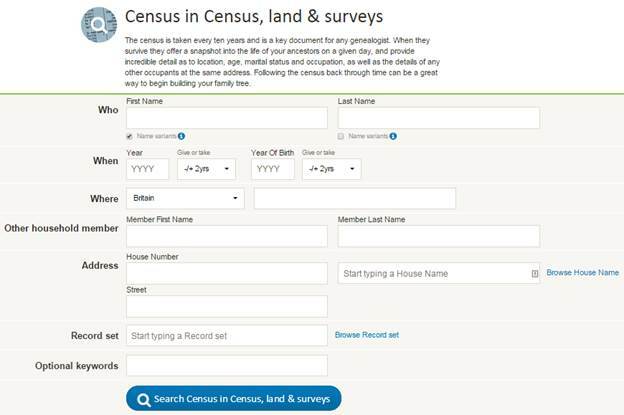 This article on the Help & Advice page includes an illustrated guide to this census - follow the example and you won't get the reference wrong. The amazing collection of aerial photographs from 1919-53 is now complete - more than 95,000 photographs are online. "In March I made contact with another lost cousin. We have been in contact almost every day since by e-mail, working together by using different sites to take our family further back and sharing in lots of interesting information, such as Wills that we both worked on to decipher. Brilliant! and tonight I got an e-mail from LostCousins to say another cousin wants to contact me. I look forward to sharing even more information with them. Thank you LostCousins. "I have already recommended this site to all my Family History Group and they have all signed on too. It's a wonderful site - and such interesting Newsletters too." It's amazing what can happen when you complete your My Ancestors page - why not take part in this amazing project to link cousins across the world? Tip: you can use your My Referrals page to send out emails to friends and relatives - or simply get a referral code if you don't have their email address. This week I received an email about the launch of the Surname Society, which appears to be in competition with the Guild of One-Name Studies (which was founded in 1979). It will be interesting to see what the new society offers. In the meantime the Guild held a seminar last Saturday entitled "One-Name Studies: The Next Stage". You can view several of the presentations online by following this link. You may recall that I recently wrote about how much I'd enjoyed reading George Redmond's book Names and History: People, Places and Things. In fact, I found it so interesting that I've just bought Surnames, DNA, & Family History by George Redmonds, Turi King, and David Hey - all experts in their respective fields. In England surnames originated with the Norman barons and knights - before the Norman Conquest nobody in England had a surname, not even the Kings. Even during the 12th and 13th centuries the nobility didn't always follow the rules that we're used to - sons didn't necessarily adopt their father's surname, wives didn't always take their husband's name. In the late 14th century there were many people in the north of England who still didn't have surnames - and many of the surnames which did exist in the earlier part of the century were completely wiped out by the Black Death. I'm already finding the book fascinating - yet I'm only on the first chapter! I shall report back again once I've made more progress - I suspect there's a lot that we think we know about surnames that will need re-evaluating. 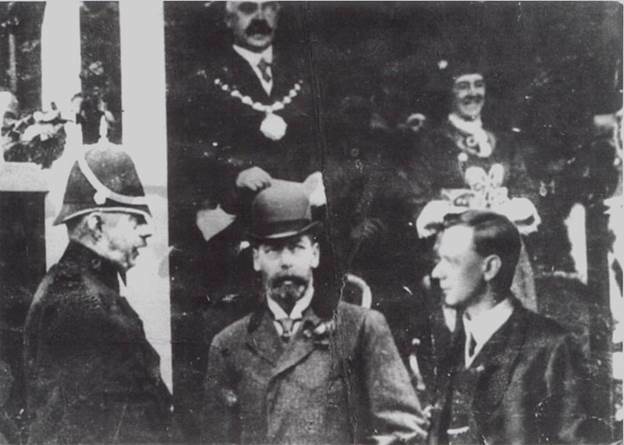 "I have a photo of my great-grandfather with King George V, a Mayor, and a policeman. The photo was sent to my great aunt by her sister many years ago, with a letter that said she'd explain when/how the photo of their father came to be in her next letter. "Unfortunately she died and no one ever found out. My Auntie doesn't think it's real and I wanted to know if there is any way of finding out. Is there an expert on Royal photos. Did they do fake photos in the 1920's or perhaps 'Photoshop' photos in the 1950's?" What you make of the photo? The dapper chap on the right is definitely Beverley's great-grandfather, Thomas Ernest Miller, and the gentleman in the bowler hat is King George V - but were they really in the same place at the same time? Beverley subsequently managed to solve the riddle - to her satisfaction and mine - by making use of her subscription to the British Newspaper Archive and searching for the visit of King George and Queen Mary to Lancashire in 1913. If you've got a subscription to the BNA (or a subscription to Findmypast which includes their British Newspaper collection) you might like to see whether you too can find the evidence - it's certainly an interesting challenge! Although Repixl won't add somebody to a photo, they will remove people or objects from photos - and all for just £4.99! Follow this link to find out more. Until Christmas you can save 20% on ALL photo editing and restoration - so instead of paying £8.99 for the amazing restoration like the one above, you'll only pay £7.19. What a great way to honour your ancestors! When you go to the online shopping basket type the code LOSTCOUSINSXMAS14 to claim your discount (and remember that LostCousins will also benefit so long as you use one of the links in this article). If you've already reserved your place I'll be writing to you shortly with booking instructions for the accommodation and the end of course dinner, but if you haven't get in touch right away - there are only a few places left, and I'd rather they went to LostCousins members. There's a 24 hour sale coming up at My Favourite Magazines, publishers of Your Family Tree, numerous computer magazines, and many other titles. Subscriptions always provide substantial saving compared to the cover price, but between mid-day on Monday and mid-day on Tuesday you will be able to save an extra 24% using the code 24HOURS (provided you spend at least £24). By my calculation this brings the cost of a 2-year subscription to Your Family Tree (26 issues) down to £56.99, which is less than you'd pay at the newsagents for a mere 11 issues, and a lot less than I'm paying for my own subscription. And providing you use the link above, LostCousins will also benefit! Just over a quarter of a century ago, when I was still running my software publishing company, I found myself sitting next to a chap I didn't know at an industry dinner. Dressed in a snazzy striped blazer (the rest of us were in conventional dinner jackets), but otherwise unassuming, he introduced himself as Chris Anderson, the founder of Future Publishing (the company that publishes all the magazines you'll find at the My Favourite Magazines site). Isn't it amazing who we bump into as meander through life? Two weeks ago I wrote about Findmypast's John Lewis offer (now ended), and mentioned the book that LostCousins member Peter Cox (who spoke at this year's Genealogy in the Sunshine) had written about Spedan Lewis, who turned the company his father founded into an employee partnership. Little did I know at the time that on Tuesday I'd be chatting with Sir Charlie Mayfield, who has been Chairman of the John Lewis Partnership since 2007 - what a coincidence! Since writing last week about the family trees that Derek Hardwick researches in order to brighten up the last days of patients at St Catherine's Hospice in Scarborough, I've been contacted by several other members who are planning something similar in their own local area. Isn't that wonderful! Finally, if you're a LostCousins subscriber it's worth taking a look at the Subscribers Only page - from time to time there are special offers posted there that aren't available to everyone. A LostCousins subscription only costs £10 a year (£12.50 for a joint subscription covering two accounts) and whilst the main benefit is the warm feeling you get from helping to support LostCousins, and keep this newsletters coming, it does also allow you to contact the 'lost cousins' you find without waiting for the next free weekend. Tip: unlike many other sites LostCousins subscriptions are NEVER renewed automatically - it isn't even an option! This is where I'll post any last minute additions - with so much going on in the genealogy world it's always worth checking back after a couple of days. You MAY link to this newsletter or email a link to your friends and relatives without asking for permission in advance - but why not invite them to join instead?